Successfully Added 5 MP Digital Camera with 2.4 Inch Touchscreen + Face Detection to your Shopping Cart. 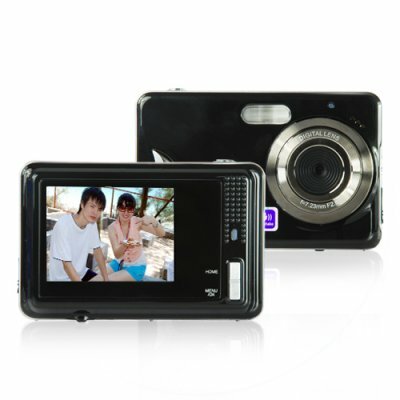 5 MP Digital Camera with 2.4 Inch Touchscreen + Face Detection. This is a fantastic, fully-featured digital 5M Pixel camera and DVR combination presented in a glossy piano black finish. Compact and lightweight, this powerful still camera and DVR device comes with a crisp 2.4 Inch Touchscreen. Coming with two function modes, the CVSE-DC05 is capable of taking still images up to 10MP resolution (interpolated) with a handy 8x Digital Zoom, and is also capable of recording color video at VGA resolution (640 x 480 pixels) at a smooth 30 FPS. The DC05 also has great features such as Face Detection, Anti-Shake and Red-Eye Correction to ensure you get the best pictures. Unleash your creativity with the bundled PhoTags Express Windows software. Simply connect your camera via USB cable and use the user-friendly software. Enhance your photos with a simple click, add captions in a variety of fonts and share your favorite photos with others by email or create an HTML web page to upload them online. The software also enables you to create and share fantastic looking Photo Calendars, two-sided personalized Greeting Cards and Postcards, Slideshow VCDs and Photo Album CDs. This digital camera will capture all your precious memories and favorite moments - with family, with friends, for all occasions. With an easy to use interface and a great feature set, this powerful combination of digital camera and DVR would be ideal for weddings, graduations, vacations, parties and all social occasions. The standby time is around 4-5 hours. The software sounds like it can do a lot: enhance photos, add captions, share photos with others and create calendars and postcards. Is it easy to use? The included software is extremely user-friendly and easy to use. Plus, it's free! is a very good digital camera but it desn´t include a batery charger for electric outlet.